The most expensive burger ever made was served in London today. It cost more than $300,000 – thanks, Google’s Sergey Brin – and didn’t taste very good. But the texture was right, and it saved a cow. Maybe one day it can save the Earth. That’s the real play behind the test-tube burgers. The hope, according to Dutch scientist Mark Post, who led the team, is that they can eventually help stop global warming. The case for moving away from raising and slaughtering animals for food is typically portrayed in terms of animal welfare. But increasingly the argument is about planetary welfare: Meat is simply a huge, huge contributor to climate change, and it’s only going to get bigger as the billions of people in emerging economies begin demanding the meat-heavy diets they associate with wealth. In this 2009 column, I laid out some of the numbers behind this debate. They’re worth thinking about today. The column is slightly edited from its original version. According to a 2006 United Nations report, livestock accounts for 18 percent of worldwide greenhouse gas emissions. That’s larger than the entire transportation sector. Burgers, in other words, are doing more damage to the planet than SUVs. Interestingly, despite mentioning cow burps and flatulence, the word “methane” appears nowhere. I wonder why? Anyhow, are we supposed to grow really expensive meat and kill off all the livestock? Interestingly, our buddies at Grist aren’t that enthused by this development. 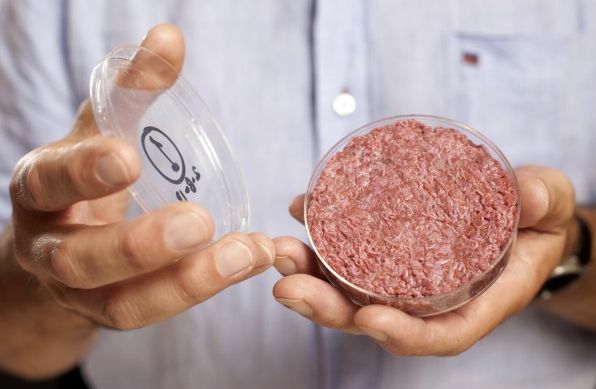 They note that this “schmeat” will only be available for the 1st world, due to costs, even if it becomes competitive within 10-20 years (unlikely). It’s doused in antibiotics. Most likely has fewer nutrients. It’s virtually fat free, and meat needs a little bit of fat for flavor. Sounds like a winner!